November is the month of the Patron of the Ukrainian Youth Association, the month we celebrate the feast of the Holy Archangel Michael (8 November – Gregorian calendar; 21 November – Julian calendar). Over all the Nine Ranks of Angels, the Lord put the Holy Leader [Archistrategos] Michael (his name in translation from the Hebrew means “Who is like unto God”) — a faithful servitor of God who hurled down from Heaven the arrogantly proud Lucifer together with the other fallen spirits. The Old Testament shows us how frequently angels intervened with the patriarchs and prophets. The Gospels show them announcing the birth of Jesus, ministering to Him in the desert and in his agony, and as a witness of His Resurrection. They are intimately involved in the life of the apostles and in the beginnings of the Church. The belief that a guardian angel is appointed as a guide and protector to each individual soul can be of great assistance in our spiritual lives. Christian tradition above all thinks of Michael as the one who is successful in combating Satan. Jude (Jude 1:9) mentions the fight over Moses’ body between Michael and the demon. In Revelation (Rev 12:7), Michael and his angles fight the dragon in heaven. The veneration of Michael began perhaps in Phrygia and was particularly developed in Constantinople and Rus’. In Constantinople, Michael was specially honored as the celestial doctor, who brought healing to the sick. The celebration of the Sobor of the leader of the Heavenly Hosts Michael was established at the beginning of the 4th century. Our ancestors chose Archangel Michael not only as the patron saint of Rus’, but also of its capital, Kyiv. Many churches have been built in his honor, including the gold-roofed St. Michael’s Sobor in Kyiv. 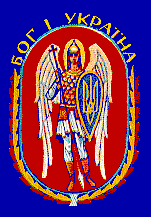 The image of the Archangel Michael was used on the national coat-of-arms by the Rus’ princes of the Monomakh line. In 1569, when the territories of Kyiv came under control of Poland, Archangel Michael was retained on the crest of the Kyiv Voievodship(?). Archangel Michael was also honored as a heavenly guardian in battles against the enemies of Christianity – the Mongols and Tartars. The use of Archangel Michael’s image was also prevalent during the kozak era – we find it on many banners from the 16th-18th centuries. [something re Khmelnytsky] It is no surprise the appearance of Archangel Michael on military standards continued into the 20th century – appearing on the flag of the Ukrainian Sich Riflemen (YCC) in 1914. This continued with his use during the revolutionary years of 1917 1923 by the Army of the Ukrainian National Republic as well as the Ukrainian Galician Army (UHA), as well during World War II by the Ukrainian Insurgent Army (UPA).